Cook pasta as directed on package, omitting salt. Drain, reserving 1/2 cup cooking water. Heat oil in large skillet on medium-high heat. Add asparagus, onions and peppers; cook 3 to 5 min. or until softened, stirring frequently and adding garlic for the last minute. Stir in reserved pasta cooking water; bring to boil. Add pasta sauce and tomatoes; stir. Simmer on medium-low heat 6 to 8 min. or until heated through, stirring occasionally. Serve over pasta. 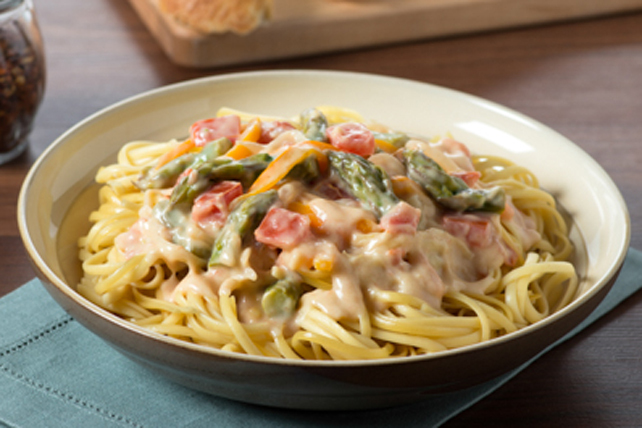 Prepare using Classico Alfredo di Toscana Mushroom Alfredo Pasta Sauce. Serve with crushed red pepper flakes for those who like heat.